I f you aren't interested in the human condition, you aren't an interesting human being. But for most of us, reading about others, especially if they are talented or unusual individuals—or perhaps just some who march to a different, distant drummer—is to follow a literary path to enchantment. Obviously the skill of the writer looms large, but for me, autobiographies, biographies, and collections of tales based on personal experience have always been right at the top when it comes to my literary preferences. Think about Robert Ruark's timeless tales of "doings" with the "Old Man," Archibald Rutledge's hundreds of stories based on his experiences at his beloved Hampton Plantation, Corey Ford's chuckle-filled accounts of The Lower Forty, or Gordon MacQuarrie's delightful probing of the Old Duck Hunters. 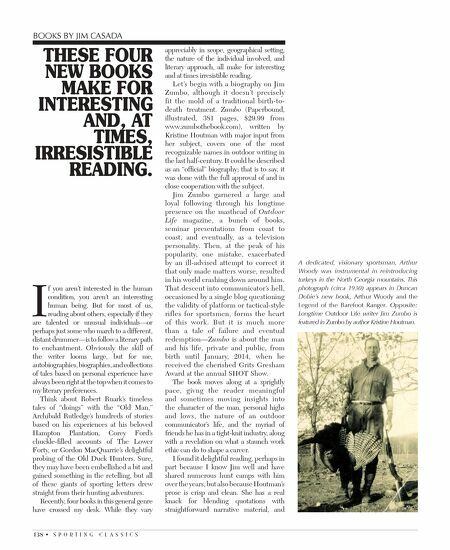 Sure, they may have been embellished a bit and gained something in the retelling, but all of these giants of sporting letters drew straight from their hunting adventures. Recently, four books in this general genre have crossed my desk. While they vary Books By Jim Casada These four new books make for inTeresTing and, aT Times, irresisTible reading. appreciably in scope, geographical setting, the nature of the individual involved, and literary approach, all make for interesting and at times irresistible reading. Let's begin with a biography on Jim Zumbo, although it doesn't precisely fit the mold of a traditional birth-to- death treatment. Zumbo (Paperbound, illustrated, 381 pages, $29.99 from www.zumbothebook.com), written by Kristine Houtman with major input from her subject, covers one of the most recognizable names in outdoor writing in the last half-century. It could be described as an "official" biography; that is to say, it was done with the full approval of and in close cooperation with the subject. Jim Zumbo garnered a large and loyal following through his longtime presence on the masthead of Outdoor Life magazine, a bunch of books, seminar presentations from coast to coast, and eventually, as a television personality. Then, at the peak of his popularity, one mistake, exacerbated by an ill-advised attempt to correct it that only made matters worse, resulted in his world crashing down around him. That descent into communicator's hell, occasioned by a single blog questioning the validity of platform or tactical-style rifles for sportsmen, forms the heart of this work. 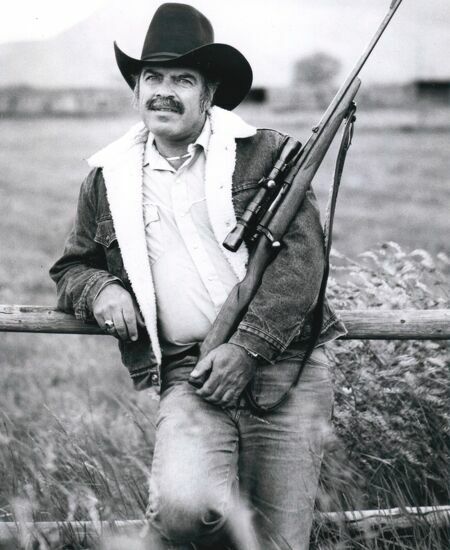 But it is much more than a tale of failure and eventual redemption—Zumbo is about the man and his life, private and public, from birth until January, 2014, when he received the cherished Grits Gresham Award at the annual SHOT Show. The book moves along at a sprightly pace, givng the reader meaningful and sometimes moving insights into the character of the man, personal highs and lows, the nature of an outdoor communicator's life, and the myriad of friends he has in a tight-knit industry, along with a revelation on what a staunch work ethic can do to shape a career. I found it delightful reading, perhaps in part because I know Jim well and have shared numerous hunt camps with him over the years, but also because Houtman's prose is crisp and clean. She has a real knack for blending quotations with straightforward narrative material, and 138 • S P O R T I N G C L A S S I C S A dedicated, visionary sportsman, Arthur Woody was instrumental in reintroducing turkeys in the North Georgia mountains. This photograph (circa 1930) appears in Duncan Dobie's new book, arthur Woody and the Legend of the Barefoot Ranger. Opposite: Longtime outdoor Life writer Jim Zumbo is featured in Zumbo by author Kristine Houtman.